WWE made its annual return to Peoria tonight in a night that saw a new twist on the WWE title match, a not-on-television Cutting Edge, and a fun brawl between the RAW babyfaces and Nexus. Henry played the power a lot here and won pretty quickly. The crowd was super into everything Mark Henry did, from shoving Zack to raising his arms up and down after the slam in his post-match celebration. Edge came out to host the Cutting Edge and said how we wouldn’t see Evan Bourne do the Shooting Star Press in their match. His guest was Sheamus. Sheamus talked about taking out Nexus, Ricky Steamboat, and Arn Anderson. The Anonymous GM apparently was in the house, and one of the Bella Twins brought out the phone. Tonight’s WWE Championship match between John Cena and Sheamus would be a lumberjack match. Santino Marella was the guest referee for this one. He did the same spot he did in January’s Champaign event, where the Divas rolled over him and he got on the turnbuckles to the applause of the male audience. Alicia faked her leg injury here, but Eve wasn’t buying it like she did on RAW. Fox got the win with the axe kick. This match was good. Lots of kicks and aerial attacks from Bourne. The finish was really cool and something I hadn’t seen before. Bourne was looking for a huracanrana on Edge off the top rope, but Edge plucked Bourne over his head and Bourne crash-landed on the turnbuckles and crumpled up for the 1-2-3. Not a spectacular finish, but Bourne got his heat back by hitting the Shooting Star Press anyway. This was another good wrestling mat. Lots of chain wrestling from Tyson Kidd. David Hart Smith played the babyface in peril for most of the match, but there were a good amount of slow spots mixed with action. If this is what their match is shaping up to be at Money in the Back, it’ll be a good one. The Miz cut a promo about how we weren’t good enough to say his lines when he went to say he was awesome the first time. He wanted us to sit down and raise our hands if we had something to say. I thought that was funny. The Miz d. Ted DiBiase and John Morrison in a triple threat match to retain the WWE United States Championship. DiBiase came out without Maryse. Morrison got beat on most of the match by the heels, who eventually turned on each other. Like a lot of triple threats, this was mainly a singles match with one guy showing up every now and again. Very reminiscent of Miz’s four-way match in Champaign. Morrison hit Starship Pain on DiBiase, and Miz hit the Skull Crushing Finale on Morrison to steal the win. 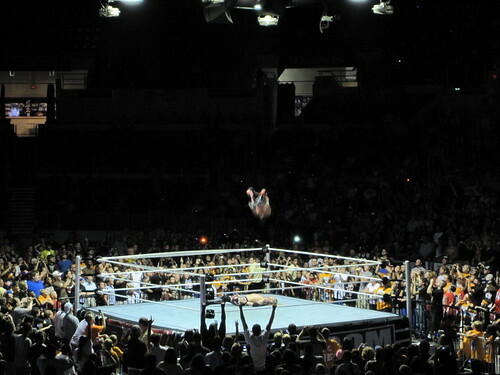 John Cena vs. Sheamus for the WWE Championship went to a no-contest. Right before the introductions, a Bella brought the GM phone to the ring. The lumberjacks were announced as the Nexus seven. After lock-ups, both Cena and Sheamus would look to make sure no Nexus member was getting involved. No matter who got sent outside, Nexus would pounce. Finally, John Cena was thrown outside and Wade Barrett called off Nexus. Instead, they attacked both Cena and Sheamus. Sheamus snuck away with the title as they beat on Cena. Evan Bourne was the first out to run out, followed by John Morrison. Mark Henry’s music hit and the entire cast of RAW babyfaces on the show were helping in the fight against Nexus. The RAW crew ran Nexus backstage, when a few of the faces brought Wade Barrett out. John Cena invited the Great Khali into the ring to give Barrett a chop, and Cena gave him the Attitude Adjustment to send the crowd home happy. I kept waiting for Randy Orton to come out and annihilate Nexus but that wasn’t meant to be tonight, I guess. I also found it weird there was no Chris Jericho. Tony Garea and what looked like IRS were the agents for this show, with IRS taking diligent notes.